Once past our goblins and their garbage monster, our young couple seems to have made it all the way to Favarial with no other incidents. And it is immediately apparent how much wealthier the city is compared to the swampy home district of Avaric. It's rich for good reason, not only is the city a city floating upon a small lake giving it a very crisp and clean look, but that lake is the only source of fresh water for all its neighbors. Which is of course a fact that the self proclaimed River Guild use to their political and monetary advantage. Of course a city with such an important resource comes equipped with both a gate and guards aplenty to guard it and the rest of the city. The two slowly plod along through stop and go traffic funneling through the gate caused by all those ready to go to the fabulous markets of the city and do what common folk do. The eventually make it through, but not before one of the guards gives them a look. Not long after, Kallist's mercenary senses tingle, and he sees a group of guards closing in on them. He gives a heads up to Liliana, and they run. They run through the back alleys making all kinds of twists and turns and casting illusions and false trails of all kinds, but in the end, none of it works, and they're caught. An officer tells them they fit the description of some folk who have been causing some trouble, and they're to be held prisoner. Liliana tries to give them the wide-eyed innocent act, but it's not enough, and they're told they're to be held for maybe a week until this whole thing can be sorted out. Kallist realizes this must have been another of Semnar's failsafes, and he tells Liliana to just play along. Perhaps they can use this against him. They bide their time in their prison cell, and determine that the guards know next to nothing about who they are, and what they can do. Escape should be no problem. (The failsafe isn't so failsafe after all... but Semner doesn't know much about magic either, so maybe it's not entirely his fault.) As the day comes to an end, a Lieutenant Albin, who I assume is the same officer, comes to greet them... and then hint to them that if they cooperate, if they give him the information that You Know Who wants, then maybe they'll be let out sooner. He has to get close and speak in obvious code because it's apparent that the Lieutenant is the only one that really knows what's going on, and he doesn't want the viashino guard who's been guarding them all day to hear their conversation. This is exactly what Kallist wanted, and as soon as Albin gets within arms reach of the bars, he drives an iron bolt into the man's thigh. (A bolt that secured the bed to the floor, that was easily wiggled free thanks to some simple telekinetic wiggling.) Then in a blink, it's back up his sleeve and hidden by illusion. The viashino hesitates for a brief moment between choosing to remain at his post or to go get help for the heavily bleeding Lieutenant. He decides to go get help. 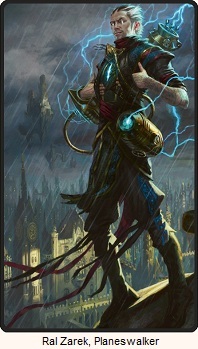 Kallist pulls out the bolt, stained with the Lieutenant's blood, and asks Liliana if it's enough. She replies that it's more than enough. Kallist is happy with that and wants to leave before they have to kill anyone that doesn't deserve it. By the time anyone comes back, they're gone. This chapter felt a little bit like filler. I actually didn't expect them to get this far already, and then going through the chapter, I started feeling like why did we even need to stop here and that we didn't go far enough. Will any of this pop up again? Is Lieutenant Albin dead? The chapter implies that they killed him (and their previous actions would suggest that's just standard operating procedure). Will there be a big hunt for them throughout the city for killing a Lieutenant and just as they're about to get caught Jace comes "walking" in and saves the day? Or was this simply a chapter to establish the unique city and layout. There's one very noticeable section that I skipped over in the summary. It's the fact that the readers know that the guards are working for Semner much sooner than Kallist realizes it. Not because we're all smart people and are thinking one good stall tactic deserves another, but because for part of the chapter we're taken out knowing just what our heroes know and are straight out told that Semner's men are on the rooftops acting as spotters for the city guard. Some of them even had clear shots for their crossbows but didn't fire because they figured that if they attacked, the mages might retaliate, so it's better to have the city guard take all the risk. Marmell could have just taken that out, and left in Kallist figuring it was Semner's influence and left it at that. 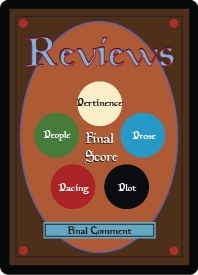 Too much detail was told in a way that seemed shoe-horned in, maybe because Marmell thought readers would need a giant neon sign telling us how regular folk caught an illusionist. We did get some more backstory on Kallist. He recognized they were being tailed quickly due to his time with some mysterious "Consortium". And despite Favarial being obviously wealthier than Avaric, it's not enough to impress him, and actually looks rather quaint. I'm sure these bits'll be brought up again. I take it that the blood wasn't for the escape, but some blood magic will be used to create some method of tracking Semner. Jace will finally appear in the next chapter or the chapter after that, and the "real" story will begin. 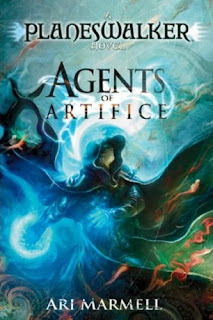 This isn't Agents of Artifice: The Quest for Jace. There's a bigger mystery afoot.